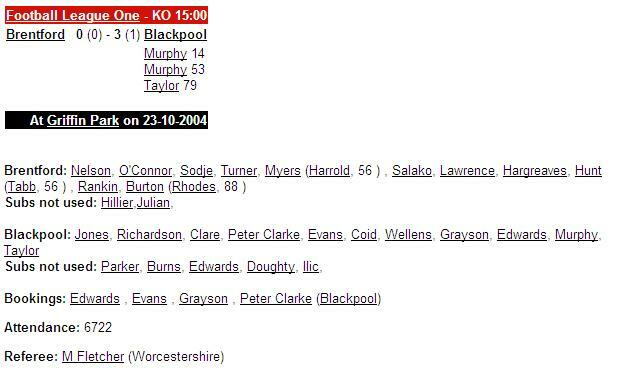 Listening to the latest Seasiders Podcast (which I thoroughly recommend), I particularly enjoyed the segment of the show where they took a walk down memory lane to discuss their all-time best and worst games as a Blackpool fan. Having somewhat neglected this blog over the last week or so, it has spurred me on to write about one of my favourite away trips, which I hope will be a regular feature. For this post, I’ve decided to reminisce about the Seasiders’ visit to Griffin Park a little under six years ago. The reason for recalling this game so fondly is down to a close friendship with a Brentford fan. In September of 2004 I had just begun my four year stint at university. On the first weekend in my new digs, I wore a retro 70s BFC shirt when I first encountered said Brentford fan, Will. He was quick to offend me by enquiring if it was a Barnet shirt, although being a Blackpool fan at this point was only a small step up from the side from Underhill. Yes, it was the Colin Hendry ‘era’ and the big Scot had made an inauspicious start to his ‘Pool tenure. The opening day defeat at Doncaster set the tone for his time in charge and marks a period I’d sooner forget. When the Brentford game eventually rolled around on 23rd October, the two sides lay at opposite ends of the league table. Under Martin Allen, the Bees were flying high in 2nd place, while Blackpool were struggling down in 21st. Despite this, in the build-up to the game there was a lot of bravado on my part. It was blind optimism, nothing more, but Will was easily wound up by my insistence that it would be an easy win for the Seasiders. We travelled down together from Sheffield on the Megabus, although nearly missed out on the trip altogether. In our student house Will was renowned for being rather lazy and failed to get up at the agreed time, resulting in a manic dash across Sheffield to reach the departure point. Upon arrival at Griffin Park, we sought refuge from the terrible conditions in one of Brentford’s famous four pubs, one on each corner of the ground. Griffin Park is the sort of ground that it is easy to miss when attending the soulless new stadia we have visited since promotion out of League One. However, that day was not the sort of day to be stood on an open terrace. In the driving rain, the hardy ‘Pool support (which I think numbered around 300) were hoping the team could provide them with something to lift their spirits. The side that took to the field that day was largely still the one put together by Steve McMahon, with only a few of those players signed by Hendry himself. Rob Clare was one of those players who had been signed with a great deal of fanfare, but failed to impress, even he was perhaps cast aside a little too quickly in my view. The spine of the side was relatively strong though, with Lee Jones, Peter Clarke, Richie Wellens, John Murphy and Scott Taylor all being players who the tangerine faithful will remember positively, at least for their on-the-field performances. The match itself was one of the few occasions where a Hendry-led ‘Pool side clicked. Far from being a smash-and-grab, it was a game Blackpool fully deserved to win. The Seasiders took an early lead through Murphy and went in 1-0 up at the break. Some bizarre antics before the second half began saw the Brentford players warm-up in the ‘Pool half, which bemused just about everyone in the crowd. Martin Allen was well known for his, shall we say, unique way of doing things in his time at Brentford, but this tactic to unsettle Blackpool failed miserably as Hendry’s team secured all three points with further goals from Murphy and Taylor. The third goal was especially good with Wellens splitting the Bees’ defence wide open to provide the assist for Taylor. It was a sweet victory, and ultimately the wind and rain only served to elevate the game an ‘I was there’ status. No doubt there’s probably thousands of ‘Pool fans who now claim they were at the match. The enjoyment for me only increased given the bragging rights I was able to enjoy over my housemate. ‘Pool went on to struggle around the lower reaches for the rest of the season, eventually finishing the season in 16th, 6 points above the relegation zone, while Brentford experienced another miserable play-off experience losing out to Sheffield Wednesday in the semis. Only one side have a worse play-off record than the Bees…I wonder who that could be!